Partido Manggagawa (PM): Workers to Sec. Bello: Is DOLE really ending endo? Workers to Sec. Bello: Is DOLE really ending endo? 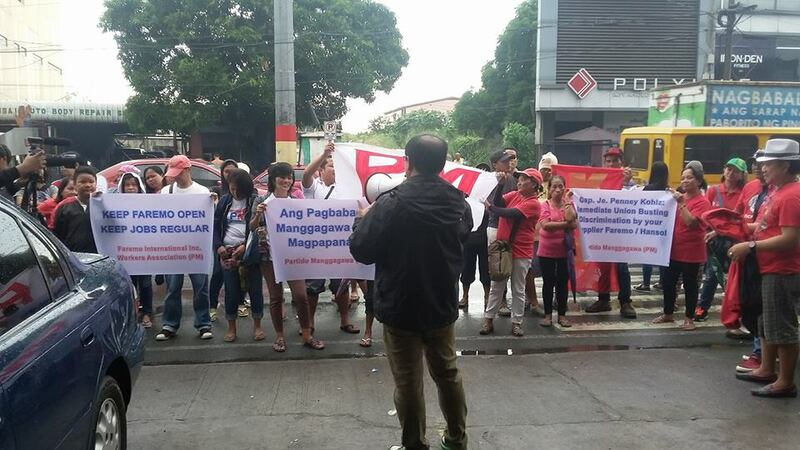 Restless over the likelihood of getting a watered down rules governing the conduct of contractualization, members of Palea, Partido Manggagawa (PM) and Church-Labor Conference (CLC) held another rally Wednesday at the DOLE offices in Intramuros Manila. The action is part of Nagkaisa labor coalition’s week-long protest to demand an end to all forms of contractualization. The rally coincides with the holding of another mediation conference between PAL and PALEA on the long-delayed implementation of the flag carrier’s commitment to re-employ Palea members under the 2013 Settlement Agreement. Said agreement ended the labor dispute over the massive outsourcing program unleashed by PAL in 2011. Also on Thursday, the last leg of regional labor summits will be concluded in Cebu and after which, a new Department Order on endo is expected to be issued by DOLE. Workers are apprehensive of DOLE’s likely preference for win-win solution due to the strong lobby of business groups, including the service providers/contractors who made big bucks under the previous regime of legalized contractualization and outsourcing. “DOLE has a very bad record in regulating endo, hence, a stricter rule for prohibition is the best option to pursue,” said Magtubo. On his part Palea President, Gerry Rivera, said a decisive and conclusive government push for the implementation of PAL-PALEA Settlement Agreement on endo can serve as preview to the resoluteness of the administration’s anti-endo campaign. “Limang taon na kaming nasa labas gayung kami ay dapat regular na empleyado ng PAL hanggang sa kasalukuyan. Hangad din namin ay hustisya dahil daig pa namin ang natokhang,” lamented Rivera. Other than PALEA, there were also cases pending before DOLE that need immediate resolutions, especially those which are related to endo.